Houston author and restaurant designer Erin Hicks has published many cookbooks that compile recipes from top Houston chefs. Writer and restaurant designer Erin Hicks is launching her fifth book, Houston Soups and Sips, with a public party at Ritual on January 18 from 5 to 9 p.m. Attendees can visit anytime during the four-hour event. On the menu for the release party are several soups, of course, with offerings from Ritual, Pax Americana, Peli Peli, Helen Greek Food and Wine, Arthur Avenue, Andes Cafe, Boada Cuisine, Agave Rio and 5115 Cuisine & Cocktails. 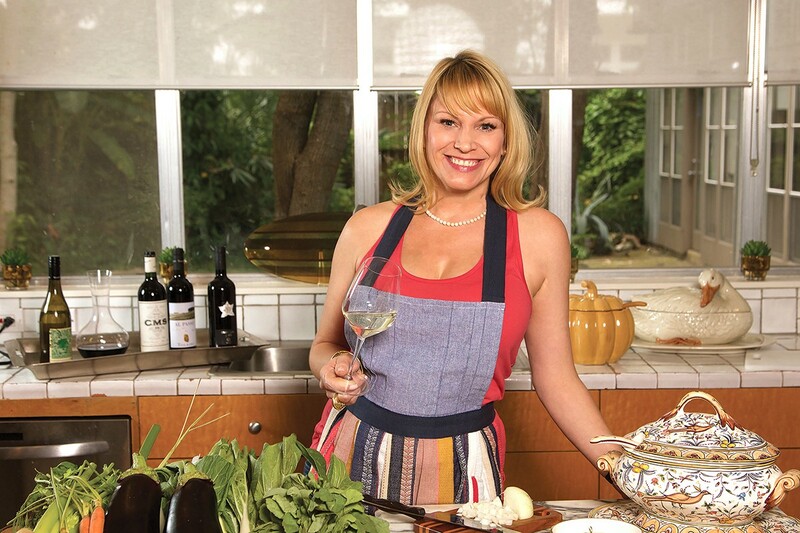 Hick’s work is the latest in a series that follows her 2012 cookbook, Houston Small Plates and Sips. (The four-year gap is mainly because Hicks has been immersed in doing the interior designs for Helen Greek Food & Wine, Arthur Ave, Brooklyn Athletic Club, El Big Bad and Glass Wall.) The new book features 60 recipes from some of Houston’s most noteworthy chefs, including chef William Wright’s (Helen Greek Food and Wine) version of the traditional Greek soup, Avgolemono; Justin Yu’s (Oxheart) Mushroom-Kombu; Ronnie Killen’s Turkey Chili and Graham Laborde’s (Bernandine’s) Cucumber Gazpacho. Other selections are from hot spots Pax Americana, State of Grace, Caracol and more. She says the book is a tribute to memories made with her grandmother. Growing up, she says she would help in the kitchen while her grandmother made soups for the family and she wanted to immortalize that experience through her cookbook. Houston Soups and Sips was written in collaboration with fellow food writer Jodie Eisenhardt. Some wine and beer pairings were recommended by in-house sommeliers and where one wasn’t available, master sommelier Guy Stout of Glazier’s and Shepard Ross of Pax Americana filled in the gaps. 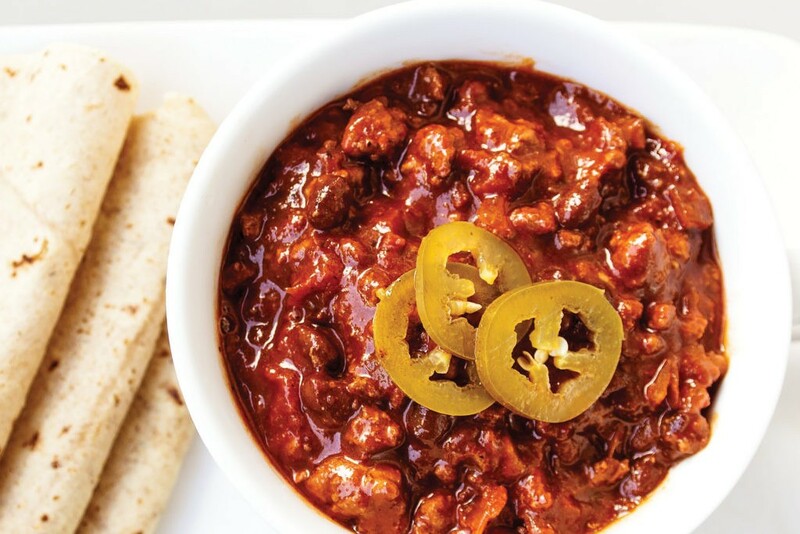 Hicks graciously shared a sample recipe with us—Ronnie Killen’s chili—as shown below. She’s hoping the book will show home cooks that soup can be a great addition to a meal – or one in itself. By way of Houston Soups & Sips, cooks can have a little bit of Houston’s dynamic dining scene in their own kitchens. If you can’t make the release party you can, of course, buy a copy of the book online. In a saucepan, heat the oil over medium-high heat. Add the turkey, season with salt and pepper, and cook over moderate heat, breaking up the meat, until white throughout, 4 to 6 minutes. Add the garlic, onion, chile powders and the cumin and cook, stirring, until fragrant, 5 minutes. Stir in the tomatoes, tomato sauce and the water and bring to a simmer. Cook over low heat, stirring occasionally, until thickened, about 45 minutes. Add the beans, and simmer for 15 minutes. Meanwhile, light a grill or heat a grill pan. Grill the tortillas over moderate heat until soft, 30 seconds per side, and wrap in a towel. Season the chili with salt and pepper. Serve with the grilled tortillas. Garnish with pickled or fresh jalapefios, if desired. Recipe Notes: You can often find ancho chili powder in the spice section of the grocery store, but to make your own, simply seed and remove the membranes of about 4 to 5 ancho chiles. Heat the oven to 375’F and toast the chiles for about 10 minutes. Place the chiles in a spice or coffee grinder and process into a fine powder. This chili also makes for a great Frito Pie—just add some shredded cheese, a dollop of sour cream, and fresh or pickled jalapeños. (A pickled jalapeño recipe is included in the book.) And, you can make this ahead of time: it can be refrigerated for up to 3 days.